For over 20 years our clients have found an easy way to obtain the big name talent they want for their corporate events, public concerts, private parties, special events, festivals, trade shows and fundraisers. You can have us just handle the contracting of the talent like an agency, or you can have us act as a producer as well and handle the entire musical portion of the event. 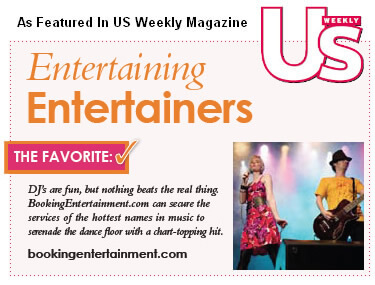 BookingEntertainment.com has been delivering turn-key fully produced live concerts worldwide for over 20 years. If we don't book someone for you, our service is free. Choose from among the many big name entertainers on our roster pages. Or give us an idea of what you have in mind and let one of our highly trained entertainment specialists work with you to book the perfect act within your budget. Once you have an idea of how you want to proceed, or if you don't know exactly who you want and you need ideas that fit your attending demographic, submit an entertainment request form and your assigned BookingEntertainment.com agent will be happy to assist you in figuring out the best options within your individual budget.